This book examines how the region’s major political powers view international politics and the use of military force. 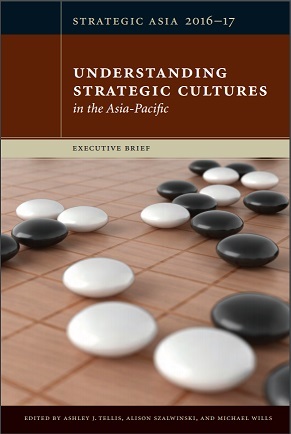 Co-edited and introduced by Ashley J. Tellis, Strategic Asia 2016-17: Understanding Strategic Cultures in the Asia-Pacific examines how the region's major powers view international politics and the use of military force. In each chapter, a leading expert analyzes the ideological and historical sources of a country's strategic culture, how strategic culture informs the thinking of the country's policymakers, and how these understandings lead to decisions about the pursuit of strategic objectives and national power. Ashley J. Tellis is a senior associate at the Carnegie Endowment for International Peace and research director of the Strategic Asia Program at the National Bureau of Asian Research (NBR). Alison Szalwinski is assistant director for political and security affairs at NBR. Michael Wills is senior vice president of research and operations at NBR.